It has taken nearly 2000 years to appreciate that a common dietary protein introduced to the human diet relatively late in evolutionary terms (some 10 000 years ago), can produce human disease not only of the gut but also the skin and the nervous system. The protean neurological manifestations of gluten sensitivity can occur without gut involvement and neurologists must therefore become familiar with the common neurological presentations and means of diagnosis of this disease. This extract is from the book on chronic diseases by Aretaeus the Cappadocian, one of the most distinguished ancient Greek doctors of the first century AD. This chapter, entitled “on the coeliac diathesis”, was the first description of coeliac disease (from the greek word κ⊝ιλιακη meaning abdominal). Aretaeus' books were first published in Latin in 1500 and the new Latin word coeliac was used to translate κ⊝ιλιακη. Coeliac disease (CD) remained obscure until 1887 when Samuel Gee gave a lecture entitled On the coeliac affection2 at the Hospital for Sick Children, Great Ormond Street, London. In it he acknowledged Areteaus' contribution and went on to give an accurate description of CD based on his own clinical observations. With clinical manifestations primarily confined to the gastrointestinal tract or attributable to malabsorption, it was logical to assume that the target organ and hence the key to the pathogenesis of this disease was the gut. The first report of neurological manifestations associated with CD was by Carnegie Brown in 1908.3 In his book entitled Sprue and its treatment he mentioned two of his patients who developed “peripheral neuritis”. Elders reported the association between “sprue” and ataxia in 1925.4 The validity of these and other such reports before 1960 remains doubtful given that a precise diagnosis of CD was not possible before the introduction of small bowel biopsies. The treatment of CD remained empirical until 1940–50 when the Dutch paediatritian Willem Dicke noted the deleterious effect of wheat flour on children with CD.5 Removal of dietary products containing wheat was shown to result in complete resolution of the gastrointestinal symptoms and a resumption of normal health. The introduction of the small bowel biopsy in 1950–60 confirmed the gut as a target organ. The characteristic features of villous atrophy, crypt hyperplasia and increase in intraepithelial lymphocytes with improvement while on gluten-free diet, became the mainstays of the diagnosis of CD. In 1961 Taylor published an immunological study of CD.6 In his paper he commented that “ . . .an obstacle to the acceptance of the immunological theory of causation has been the lack of satisfactory demonstration of antibodies to the protein concerned”. He went on to demonstrate the presence of circulating antibodies against gliadin (antigliadin antibodies), the protein responsible for CD. This provided further evidence that CD was immunologically mediated and that the immune response is not confined to the mucosa of the small bowel. Antigliadin antibodies became a useful screening tool for the diagnosis of CD. In 1966, Marks et al demonstrated an enteropathy in nine of 12 patients with dermatitis herpetiformis,7 an itchy vesicular skin rash mainly occurring over the extensor aspect of the elbows and knees. The enteropathy had a striking similarity to that seen in CD. It was later shown that the enteropathy and the skin rash were gluten dependent but skin involvement could occur even without histological evidence of gut involvement. This was the first evidence that the gut may not be the sole protagonist in this disease. In 1966 Cooke published a landmark paper on 16 patients with neurological disorders associated with adult CD.8 This was the first systematic review of the subject after the introduction of diagnostic criteria for CD. Ten of these patients had a severe progressive neuropathy. All patients had gait ataxia and some had limb ataxia. Neuropathological data from postmortem examinations showed extensive perivascular inflammatory changes affecting both the central and peripheral nervous systems. A striking feature was the loss of Purkinje cells with atrophy and gliosis of the cerebellum. All 16 patients had evidence of severe malabsorption as evidenced by anaemia and vitamin deficiencies as well as profound weight loss. A review of all such reports (with biopsy proved CD) from 1964 to date shows that ataxia and peripheral neuropathy are the commonest neurological manifestations seen in patients with established CD (table 1). Less common manifestations include inflammatory myopathies10 and myoclonic ataxia.11 Isolated dementia is uncommon and most cases tend to have additional neurological features (for example, ataxia or neuropathy). Patients with epilepsy associated with occipital calcifications on CT and CD have been described,12 mainly in Italy. Most present with epilepsy in childhood. Such cases are rare in the United Kingdom. Some studies looking at normal populations have shown that the prevalence of CD is much higher than previously thought13,14 (approximating to 1 in 100). Most of such patients have no gastrointestinal symptoms. In addition, experimental data in patients with gluten sensitivity suggest that there is a range of mucosal abnormalities affecting the small bowel ranging from preinfiltrative (histologically normal) to infiltrative, to hyperplastic to flat destructive (seen in CD), and finally to the irreversible hypoplastic atrophic lesions.15 Increasing the gluten load may result in progression of the severity of the lesion. In those patients where the histology is normal, staining of the T cell subpopulations of the intraepithelium of the small bowel biopsies shows alteration of T cell subpopulations of the intraepithelial lymphocytes (increase of the γ/δ T cells). This finding is said to be a marker of potential CD.16 This procedure is only available in a very few pathology laboratories, rendering its use limited. Finally, CD has a very strong association with the human lymphocyte antigen (HLA) of the major histocompatibility complex. Ninety per cent of patients with CD have the HLA DQ2; the rest have DQ8. These advances suggest that gastrointestinal symptoms are absent in most patients with CD, that the definition of gluten sensitivity can no longer be solely based on the presence of an enteropathy and that genetic susceptibility may be an important additional marker for gluten sensitivity. Given the knowledge of these advances and approaching gluten sensitivity from a neurological perspective we set up to address the following question: Does cryptic gluten sensitivity play a part in neurological illness? Systematic screening of 143 patients with so-called “idiopathic sporadic ataxia” showed that 41% had gluten sensitivity as defined by the presence of circulating antigliadin antibodies20 (IgG with or without IgA). The prevalence of antigliadin antibodies in 51 patients with familial ataxia did not differ from that found in normal healthy control subjects (13%). The mean age of onset of the ataxia was 54 but we have recently seen three patients with early onset (under 20 years of age) sporadic idiopathic ataxia and gluten sensitivity. Recently four patients have been described with CD presenting as gait disturbance and ataxia in infancy.21 Alhough the ataxia tends to be slowly progressive, in some cases it can take a very rapid course with the development of cerebellar atrophy within a year of the onset of the illness (fig 1). Ataxia and myoclonus is a much less common presentation (only four patients in these series). We have encountered two patients who in addition to ataxia had evidence of chorea but normal genetic testing for Huntington's disease. Gluten ataxia primarily affects the lower limbs and gait. Extrapyramidal or autonomic features are rarely apparent and these features distinguish it from the cerebellar variant of multisystem atrophy (MSA). Screening of patients with clinically probable MSA (cerebellar variant) for the presence of antigliadin antibodies showed the prevalence to be similar to the normal population. Brain MRI usually shows cerebellar atrophy; sometimes with evidence of white matter abnormalities. Up to 40% of patients also have a sensorimotor axonal peripheral neuropathy that can often be subclinical. In a few cases oligoclonal bands are present in the CSF. 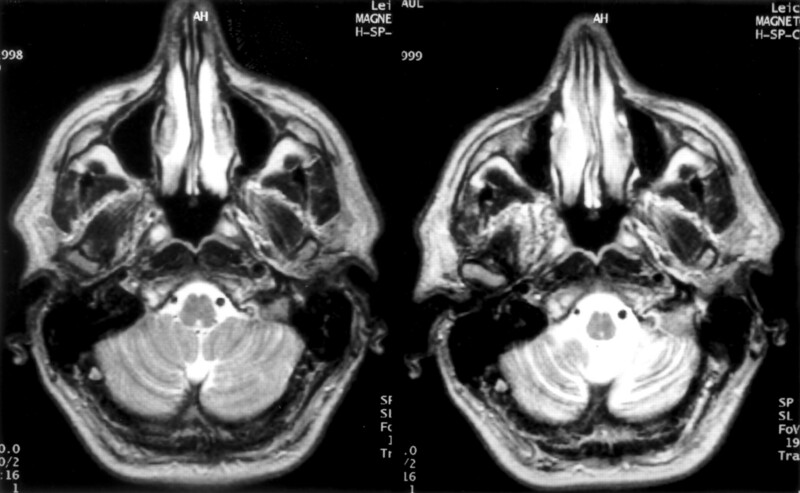 Brain MRI of a patient with gluten ataxia showing rapid onset of cerebellar atrophy over a period of 15 months before the diagnosis of gluten ataxia. Peripheral neuropathy is the second commonest manifestation of gluten sensitivity. Prospective screening of 101 patients with idiopathic peripheral neuropathy has shown the prevalence of gluten sensitivity to be 40% (unpublished data). The commonest type of peripheral neuropathy we encountered is sensorimotor axonal (26) followed by mononeuropathy multiplex (15), pure motor neuropathy (10), small fibre neuropathy (four) and mixed axonal and demyelinating (two). The neuropathy is usually chronic and of gradual progression. Patients with a pure motor neuropathy may progress to involvement of sensory fibres. We encountered eight patients with myopathy and gluten sensitivity. Three had an additional neuropathy. Muscle biopsy showed inflammatory changes in five. One patient had evidence of inclusion body myositis. One patient had low concentrations of vitamin D and a predominantly proximal myopathy. Myelopathy is rare in our series and was only seen in two patients. We have recently identified a subgroup of patients with gluten sensitivity who complained of episodic severe headache often with transient neurological deficit and extensive white matter abnormalities on MRI.22 Some of them also had ataxia or neuropathy. Their headache resolved with the introduction of a gluten free diet though the MRI abnormalities persisted at least for the short follow up period. We have also found a higher incidence of gluten sensitivity in patients with systemic vasculitis and neurological involvement, perhaps reflecting the autoimmune nature of gluten sensitivity. There is a well known association of CD with other autoimmune diseases23 (for example, diabetes, thyroid disease). This may account for the finding of the presence of antigliadin antibodies in all four of our patients with stiff-person syndrome. IgG anti-gliadin antibodies have been the best diagnostic marker in the neurological population we have studied. IgG anti-gliadin antibodies have a very high sensitivity for CD but they are said to lack specificity. In the context of a range of mucosal abnormalities and the concept of potential CD, they may be the only available immunological marker for the whole range of gluten sensitivity of which CD is only a part. Further support for our contention comes from our HLA studies. Within the group of patients with neurological disease and gluten sensitivity (defined by the presence of anti-gliadin antibodies) we have found a similar HLA association to that seen in patients with CD: 70% of patients have the HLA DQ2 (30% in the general population), 9% have the HLA DQ8, and the remainder have HLA DQ1. The finding of an additional HLA marker (DQ1) seen in the remaining 20% of our patients may represent an important difference between the genetic susceptibility of patients with neurological presentation to those with gastrointestinal presentation within the range of gluten sensitivity. The introduction of more CD specific serological markers such as anti-endomysium and more recently transglutaminase antibodies may have helped in diagnosing CD but their sensitivity as markers of other manifestations of gluten sensitivity (where the bowel is not affected) is low. This certainly reflects our experience with patients with gluten sensitivity who present with neurological dysfunction. Endomysium and transglutaminase antibodies are only positive in the majority but not in all patients who have an enteropathy. Patients with an enteropathy represent only a third of patients with neurological manifestations and gluten sensitivity. Antigliadin antibodies unlike endomysium and transglutaminase antibodies are not autoantibodies. They are antibodies against the protein responsible for gluten sensitivity. Only one third of the patients with neurological disorders associated with gluten sensitivity have villous atrophy on duodenal biopsy. Even some with biochemical markers of malabsorption such as low serum vitamin B12, low red cell folate, or vitamin D concentrations had normal conventional duodenal histology.17 These cases may illustrate the patchy nature of bowel involvement in coeliac disease and the inaccurate interpretation of duodenal biopsies by inexperienced histopathologists. Preliminary data based on staining of the subpopulation of T cells in the small bowel epithelium suggests that these patients have potential CD.24 There are, however, patients where the immunological disorder is primarily directed at the nervous system with little or no damage to the gut. Our practice is to offer a gluten-free diet to these patients unless the HLA genotype is not consistent with susceptibility to gluten intolerance (that is, other than HLA DQ2, DQ8, or DQ1). All patients are followed up and any clinical response is documented. Reports in the literature of the effect of the gluten-free diet on neurological dysfunction are conflicting. Almost all patients reported in the literature have the diagnosis of CD before the development of neurological dysfunction. They may represent a different group of patients from those presenting with neurological dysfunction without bowel involvement. Additionally, improvement of gastrointestinal symptoms and improvement of the histological abnormalities on repeat small bowel biopsy often were the measures used to assess the response to the diet. Serological evidence of response (for example, sustained elimination of antigliadin antibodies) has rarely been used as confirmation of strict adherence to the gluten-free diet. Incomplete elimination of gluten from the diet may be enough to abolish gastrointestinal symptoms with recovery of the small bowel mucosa but is insufficient to arrest the state of heightened immunological responsiveness resulting in neuronal injury. There is a group of patients with CD “resistant” to gluten-free diet. This may reflect hypersensitivity to the minute amounts of gluten present in most “gluten-free” products. An analogous situation may exist in cases of gluten ataxia or gluten related neuropathy. The monitoring of neurological improvement in such cases is made difficult by the slow and sometimes incomplete regeneration of the nervous system. In cases of gluten ataxia where the underlying pathology is loss of Purkinje cells, one may only expect the stabilisation of the disease without any definite clinical improvement. This is in marked contrast to the response seen in patients with florid gastrointestinal symptoms who notice almost immediate improvement after the introduction of a gluten-free diet. Nutrient deficiencies (B12, folate, vitamin D, vitamin E) are rare in this neurological population. Given that two thirds of these patients have no enteropathy this is hardly surprising. The concept of the neurological manifestations being nutritional in origin is now outmoded. Intestinal mucosal damage in coeliac disease is the result of both humoral and T cell mediated inflammation. Such inflammation is not, however, confined to the gut, as activated HLA restricted gliadin specific T cells25 and antigliadin antibodies are found systemically. Antigliadin antibodies are also found in the CSF.26 Postmortem findings from two of our patients with gluten ataxia has shown perivascular cuffing with both CD4 and CD8 cells. This inflammation was primarily seen in the white matter of the cerebellum. There was also marked but patchy Purkinje cell loss. We have also found antibodies against Purkinje cells in patients with gluten ataxia. Our research suggests that IgG antigliadin antibodies cross react with epitopes on Purkinje cells from human cerebellum.27 Characterisation of the anti-Purkinje cell antibodies by immunoblotting may provide a useful marker for the diagnosis of gluten ataxia in a manner analogous to the use of antiendomysium antibodies as a marker for coeliac disease or the anti-Yo antibody in paraneoplastic cerebellar degeneration. Gluten sensitivity is best defined as a state of heightened immunological responsiveness in genetically susceptible people.15 This definition does not imply bowel involvement. That gluten sensitivity is regarded as principally a disease of the small bowel is a historical misconception.28 Gluten sensitivity can be primarily and at times exclusively a neurological disease.29 The absence of an enteropathy should not preclude patients from treatment with a gluten-free diet. Early diagnosis and removal of the trigger factor by the introduction of gluten-free diet is a promising therapeutic intervention. IgG antigliadin antibodies should be part of the routine investigation of all patients with neurological dysfunction of obscure aetiology, particularly patients with ataxia and peripheral neuropathy. We are currently conducting a trial of the effect of gluten-free diet in patients with gluten ataxia and would welcome referrals of patients with sporadic idiopathic ataxia. We have received funds from SHS International and Ultrapharm Ltd towards a pilot study of the effect of gluten-free diet on patients with neurological dysfunction and gluten sensitivity and a grant from The Friedreich's Ataxia Group for research into the immunological mechanisms of the pathogenesis of gluten ataxia. Aretaeus. Liber IV περι κ⊝ιλιακης διαθεσι⊝ς. In: Corpus Medicorum Graecorum. Berlin: Akademie-Verlag GmbH 1956:74. Gee S. On the coeliac affection. St Bartholomew's Hospital reports1888;24:17–20. Brown C W. Sprue and its treatment. London: J Bale, sons, and Danielson, 1908. Elders C. Tropical sprue and pernicious anaemia, aetiology and treatment. Lancet1925;i:75–7. Dicke W K, Weijers HA, Van De Kamer JH. Coeliac disease II; the presence in wheat of a factor having a deleterious effect in cases of coeliac disease. Acta Paediatrica1953;42:34–42. Taylor KB, Truelove SC, Thomson DL, et al. An immunological study of coeliac disease and idiopathic steatorrhoea. BMJ1961;2:1727–31. Marks J, Shuster S, Watson AJ. Small bowel changes in dermatitis herpetiformis. Lancet1966;ii:1280–2. Cooke WT, Thomas-Smith W. Neurological disorders associated with adult coeliac disease. Brain1966;89:683–722. Holmes GKT. Neurological and psychiatric complications in coeliac disease. In: Gobbi G, Anderman F, Naccarato S, et al, eds. Epilepsy and other neurological disorders in coeliac disease. London: John Libbey, 1997. Henriksson K G, Hallert C, Norrby K, et al. Polymyositis and adult coeliac disease. Acta Neurol Scand1982;65:301–19. Lu C S, Thompson PD, Quin NP, et al. Ramsay Hunt syndrome and coeliac disease: a new association. Mov Disord1986;1:209–19. Gobbi G, Bouquet F, Greco L, et al. Coeliac disease, epilepsy, and cerebral calcifications. Lancet1992;340:439–43. Grodzinsky E, Franzen L, Hed J, et al. High prevalence of celiac disease in healthy adults revealed by antigliadin antibodies. Annals of Allergy1992;69:66–9. Catassi C, Ratsch IM, Fabiani E, et al. Coeliac disease in the year 2000: exploring the iceberg. Lancet1994;343:200–3. Marsh MN. The natural history of gluten sensitivity: defining, refining, and re-defining. Q J Med1995;85:9–13. Maki M, Holm K, Collin P, et al. Increase in gamma/delta T-cell receptor bearing lymphocytes in normal small bowel mucosa in latent coeliac disease. Gut1991;32:1412–14. Hadjivassiliou M, Gibson A, Davies-Jones G A B, et al. Is cryptic gluten sensitivity an important cause of neurological illness? Lancet1996;347:369–71. Hadjivassiliou M, Grünewald RA, Chattopadhyay AK, et al. Clinical, radiological, neurophysiological and neuropathological characteristics of gluten ataxia. Lancet1998;352:1582–5. Hadjivassiliou M, Chattopadhyay AK, Davies-Jones GAB, et al. Neuromuscular disorder as a presenting feature of coeliac disease. J Neurol Neurosurg Psychiatry1997;63:770–5. Hadjivassiliou M, Grünewald RA, Davies-Jones GAB. Causes of cerebellar degeneration: gluten ataxia in perspective. J Neurol Sci2001;187(suppl 1):S520. Hahn JS, Sum JM, Crowley RS, et al. Coeliac disease presenting as gait disturbance and ataxia in infancy. J Child Neurol1998;13:351–3. Hadjivassiliou M, Grünewald RAG, Lawden M, et al. Headache and CNS white matter abnormalities associated with gluten sensitivity. Neurology2001;56:385–8. Ventura A. Coeliac disease and autoimmunity. In: Lohiniemi S, Collin P, Maki M, eds. Changing features of Coeliac disease. Tampere: The Finnish Coeliac Society 1998:67–72. Hadjivassiliou M, Grünewald RA, Davies Jones A, et al. Gluten ataxia – insights into the pathophysiology. J Neurol Neurosurg Psychiatry 1999;67:262. Jensen K, Sollid LM, Scott H, et al. Gliadin-specific T cell responses in peripheral blood of healthy individuals involve T cell clones restricted by the coeliac disease associated DQ heterodimer. Scand J Immunol1995;42:166–70. Chinnery PF, Reading PJ, Milne D, et al. CSF antigliadin antibodies and the Ramsay Hunt syndrome. Neurology1997;49:1131–3. Hadjivassiliou M, Grünewald RA, Davies-Jones GAB, et al. The humoral response in the pathogenesis of gluten ataxia. Ann Neurol2001;50(suppl 1):S37. Hadjivassiliou M. On the neurological manifestations of gluten sensitivity [MD thesis]. Sheffield: Department of Health Sciences, University of Sheffield, 1999. Hadjivassiliou M, Grünewald RA, Davies-Jones GAB. Gluten sensitivity: a many-headed hydra [editorial]. BMJ1999;318:1710–11.